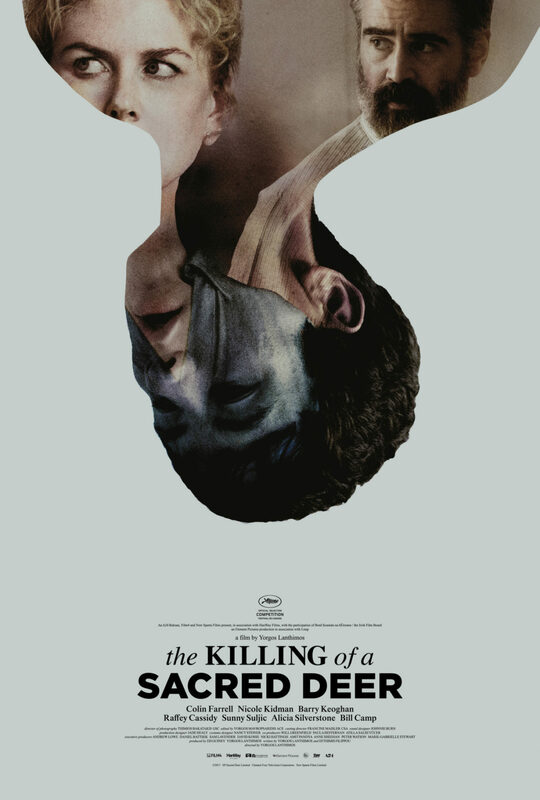 After winning widespread acclaim for The Lobster two years ago, writer/director Yorgos Lanthimos is back with The Killing of a Sacred Deer. The movie reteams him with star Colin Farrell, who here plays Dr. Steven Murphy, a successful surgeon who leads a comfortable, respectable and luxurious life with his wife Anna (Nicole Kidman) and their two teenage children. Steven has, unbeknownst to most everyone, taken a teenage boy named Martin (Barry Keoghan) under his wing. That turns out to be a poor decision as Martin’s behavior becomes increasingly erratic and dangerous. Not only does he threaten to expose a secret of Steven’s from long in the past but he also makes it clear he’s a danger to the whole family. 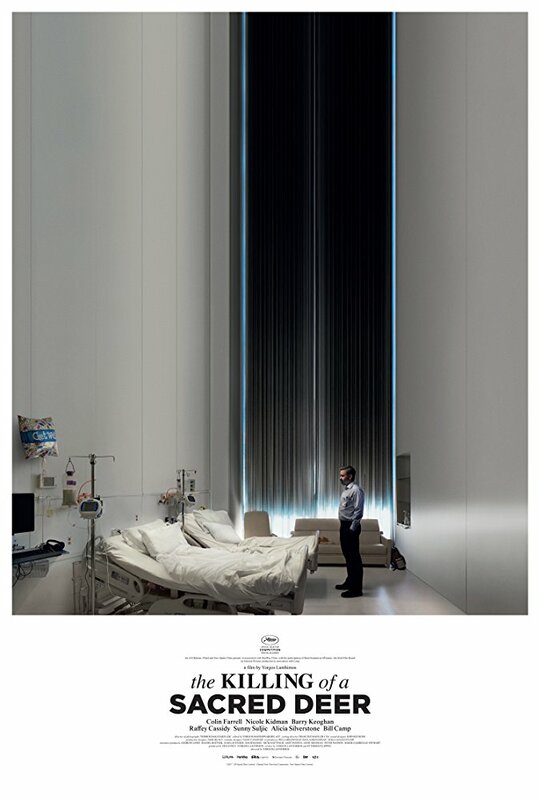 Farrell stands alone in an absurdly tall hospital room on the first poster, facing two empty beds as if pondering the people who are no longer in them. There’s no other copy aside from the title and credits and nothing to provide additional story context, so it’s just about selling a unique look and feel here. The second poster features an upside down image of Martin, a photo of Steven and Anna appearing inside the outline of Martin’s picture. That’s meant to convey how the two parties have become intertwined, the fact that Martin’s photo is upside down adding to the sense of disorientation in the audience. There’s no clear story in the first trailer, instead it’s more focused on setting up some sort of medical mystery and family drama. Somehow a young girl winds up not able to move and that has an impact on the rest of her family as well as the surgeon who has handled her case. What else is happening isn’t apparent, other than that there will be both psychological and physical torture going on. A second short trailer has Martin coming to the house of Anna and the rest of the family. Martin makes cryptic, threatening comments to Steven about his family and how they’re all going to get sick and die. There’s a connection between the two that’s not great and which is going to have an impact on everyone around Steven and Anna. There isn’t a whole lot going on at A24’s official website for the movie. There’s a prompt to play the trailer and one to get tickets. Toward the bottom are links to the movie’s Facebook, Instagram and Twitter profiles. The primary feature is “Doctor What’s Wrong With Me?” That takes you to a stand-alone website that lets you diagnose what might be wrong with you by pointing and clicking on different parts of an anatomy. All the answers, of course, are more emotional and mental than physical. There’s also a test you can take that seems designed to test your empathy and attitude toward the harsh realities of life. It’s very similar to the site launched in conjunction with The Lobster, which was designed to see what animal you should be when you fail to find a mate. Nothing on this front that I’ve been exposed to. There may have been some ads in the real world and online that were targeted at the movie’s initial release markets, but I’m not aware of them. The movie was one of the handful that had its premiere at this year’s Cannes International Film Festival. It was later also added to the Fantastic Fest schedule. The movie was one of a few Kidman appeared in at the festival, leading to a narrative in the press about the actress’s resurgence and her work ethic. Later on Silverstone talked about how she got involved with the film and what it was like shooting with Farrell. This marking their second collaboration, there was a joint interview with Farrell and Lanthimos where they talked about how they began working together, what they enjoy about the process and lots more. Anyone who wasn’t already a fan of Lanthimos’ previous work, including those who first discovered him through 2015’s The Lobster, isn’t going to find a lot to latch onto with this campaign. There’s no, or little, sense of the story or character offered anywhere in the marketing that A24 has offered for this new movie. Anyone who saw the trailer in front of something more mainstream likely came away confused and uninterested. It’s inaccessible, providing no easy jumping on point for the uninitiated. For those a bit savvier and already in tune with what the filmmaker is doing, though, it offers a wealth of good stuff. The efforts shows the visual richness of Lanthimos’ style and the complex moral territory his stories frequently tread into. The publicity push hasn’t been all that substantial, but that’s a small criticism for an overall campaign that’s consistent from one element to the next and knows just what will bring in the kind of audience it’s hoping to find.